The Nore Valley Park Christmas Experience ‘the event’ is being located at Cillin Hill, Kilkenny and is being run by Nore Valley Park. Tickets are only valid for use on the date stated on the ticket. Tickets will be refunded if they are cancelled more than fourteen days prior to the date booked for the event. If cancelled less than fourteen days from booked date for the event, no refund will be provided. This ticket is for Nore Valley Park Christmas Experience admission only, not valid for any other advanced ticket only event. The ticket must be either printed on paper or shown on your mobile device with the barcode legible. Nore Valley Park reserves the right to refuse entry. Re-entry to the site will only be allowed on verification and receipt of admission payment or ticket. 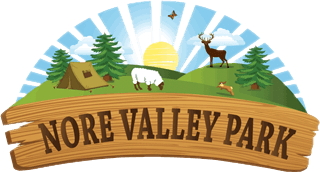 Nore Valley Park is unable to accept liability for personal damages, losses or injuries sustained at this site – including, but not limited to damage and losses to property and motor vehicles – if the cause is due to negligence of the ticket holder or the actions of other patrons. Tickets are not to be used as any part of any marketing, sales or media promotion, whether commercial or non commercial, without the prior written consent of Nore Valley Park. Strictly no trading within the venue without written consent or agreement with Nore Valley Park. No dogs are allowed on site, apart from guide dogs. Smoking is not permitted anywhere within the site. Smoking is only permitted in designated space in the car park area. A child is an individual aged up to 15 years inclusive. An adult is an individual aged 16 years and older. Personal data is used for Nore Valley Park purposes only, data is not passed to third parties. Ticket holders give their express consent to the use of the actual or stimulated likeness in connection with the production, exhibition, advertising and/or exploitation of any photos, film, video and/or audio recording of this event and/or any element there of in any/all media. Nore Valley Park, reserves the right to change the lineup and activities on offer without prior notice and all artists and billed attractions may be subject to change.